Meg Whalen studied business at Elon University in North Carolina, but soon after realized that her talents and passions were pulling her in a different direction. Inspired from a young age by comic strips like Calvin & Hobbes and gaining a new appreciation for the beauty in children’s books, she moved to Colorado and enrolled in the children’s book illustration program at Rocky Mountain College of Art & Design. 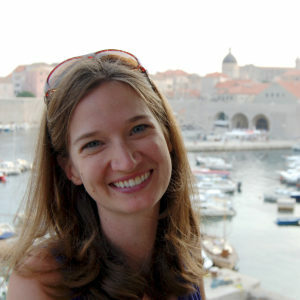 While living in Denver, she also completed a master’s degree in Theology at the Augustine Institute. She now lives in Florida with her husband, Danny, and their book loving children. Meg’s favorite medium is a combination of pencil and watercolor on bristol vellum paper. Recently she has been exploring digital techniques to allow for more flexibility for all that life with a curious toddler may throw at her (and her artwork).